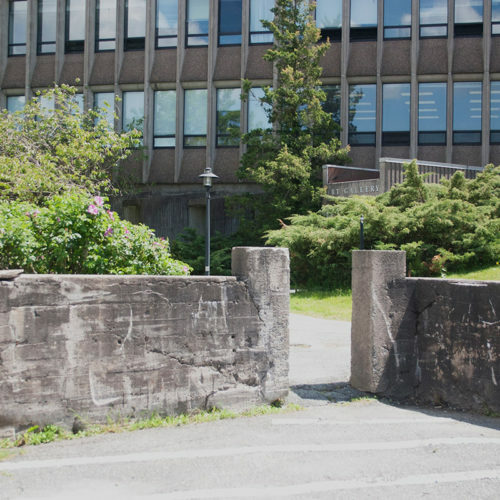 **Google Maps and MSVU Campus maps often provide directions to a side entrance that is not barrier-free. Please consult the information provided below for directions to the gallery and information about each entrance. 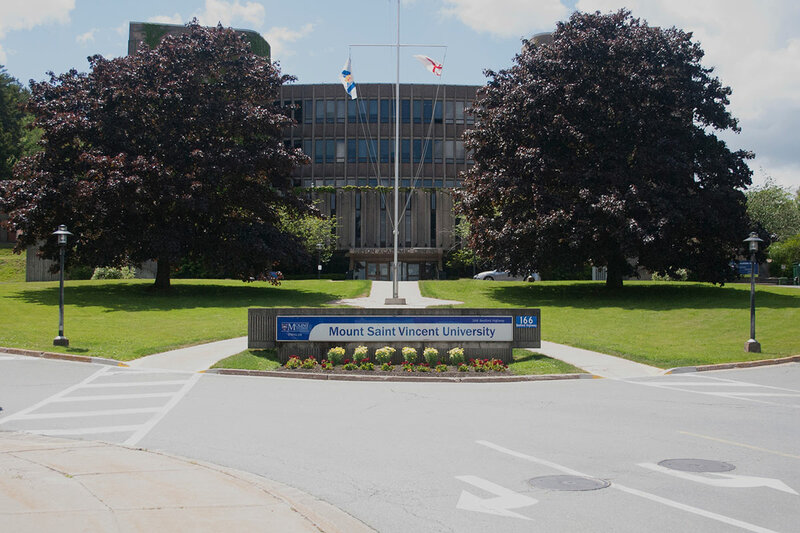 MSVU Art Gallery is accessible by public transit, which is served by a number of routes both inbound to and outbound from Halifax. 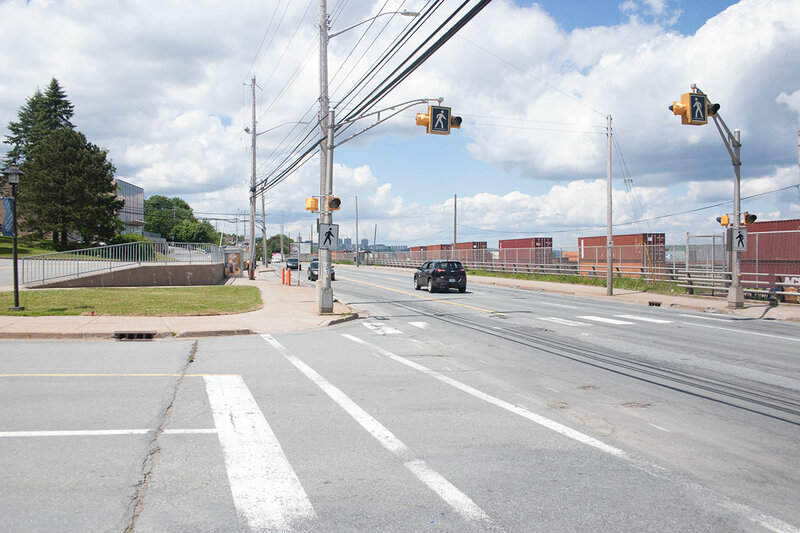 If you are arriving by bus outbound from Halifax, you will need to cross the Bedford highway once you’ve disembarked at the bus stop. 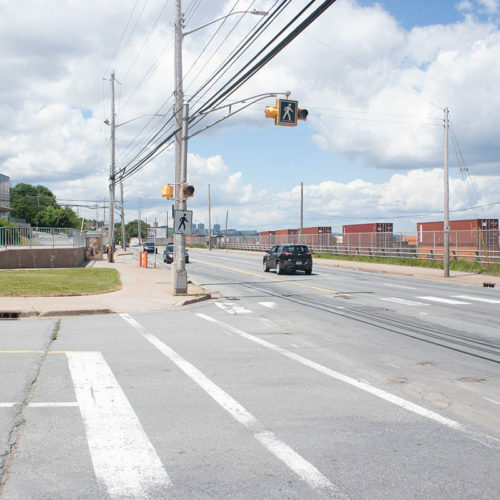 There is a crosswalk with button-activated crossing lights to stop traffic. This is a very busy road so please be careful and ensure cars have stopped before you cross. 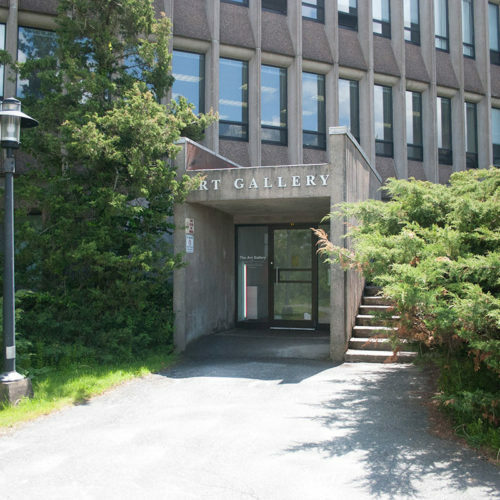 When arriving by bus inbound to Halifax there is no need to cross the highway as you will exit the bus on the same side of the road as the Gallery. The sidewalks all have curb cuts in the appropriate places. 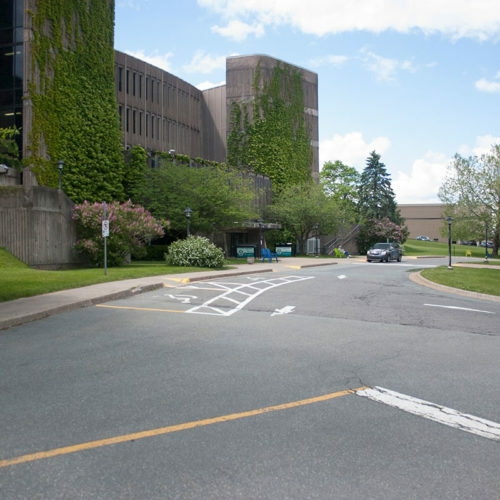 Once you are on the same side of the street as the Gallery, you will need to cross part of the university driveway (crosswalk seen in image). 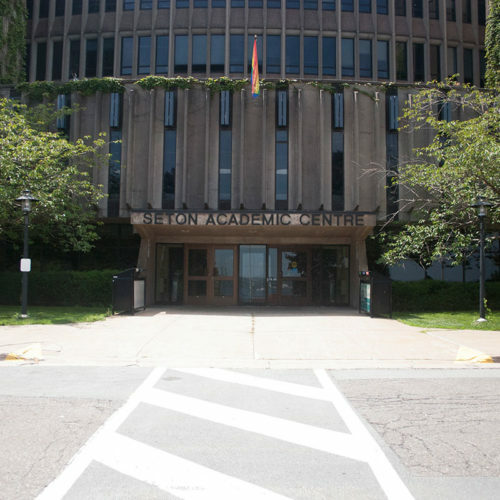 There is a moderately steep uphill slope to the building. 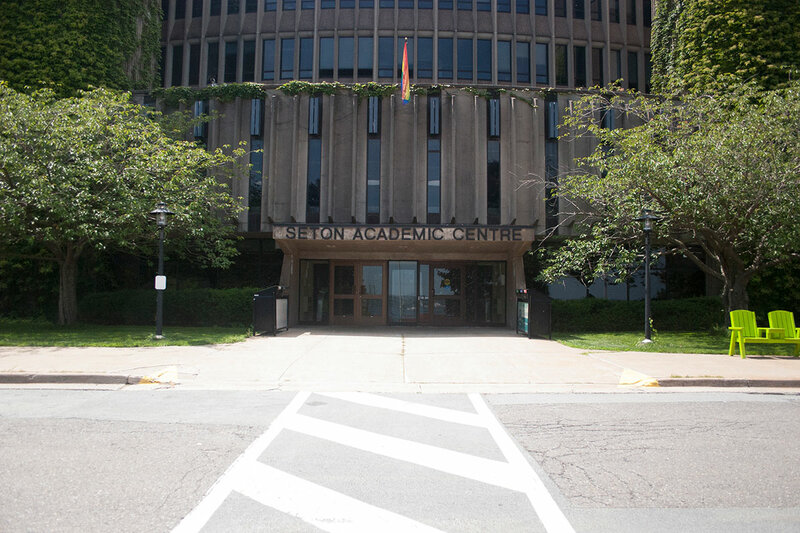 To get to the top of the hill, there is a sidewalk path straight to the entrance of the building. This sidewalk also includes curb-cuts and crosswalks where the parking lot intersects the path. 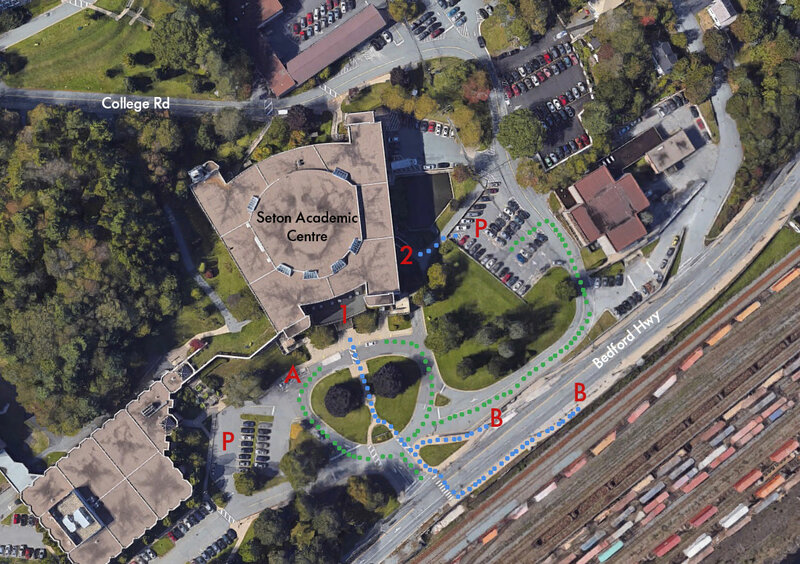 The path will end with a sidewalk which you will cross to arrive at the entrance to the building. 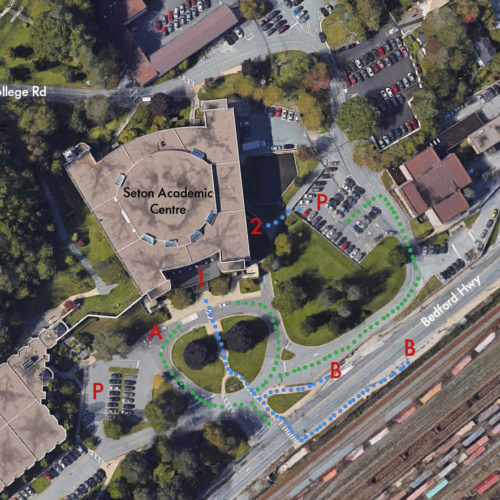 At the top of the circular driveway loop, there is a drop-off zone located in front of the building’s main entrance. 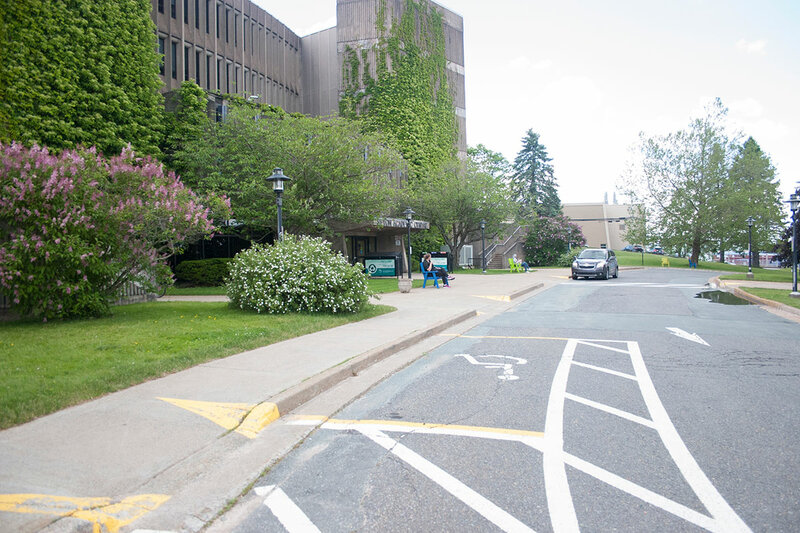 There are two accessible parking spots with curb cuts located to one side of the main entrance, near the drop-off zone in front of the entrance doors. 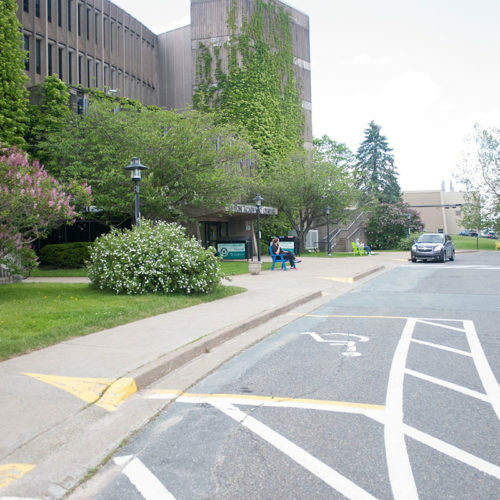 Further past the accessible parking spots is a parking lot for non-accessible parking. 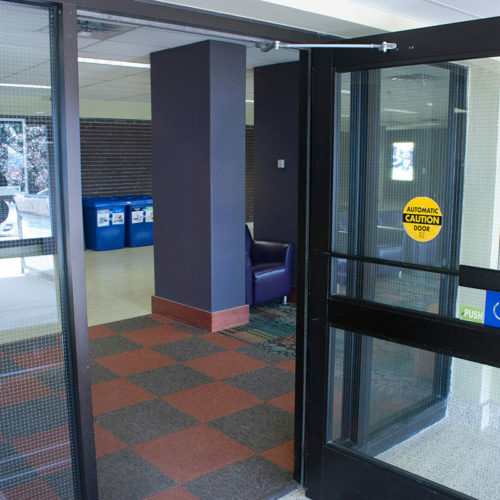 At the entrance of Seton Academic Centre there are two sets of doors to enter the building. 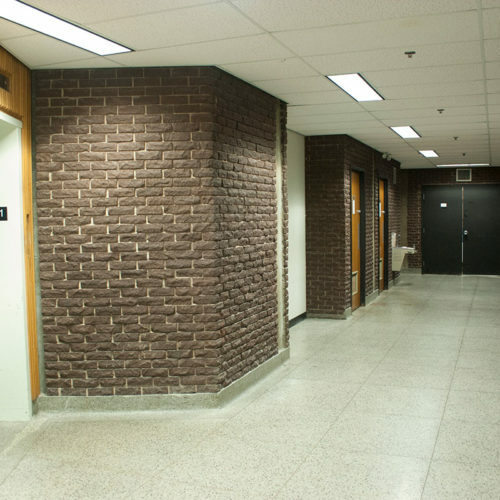 The doors on the right are automated and are 100 cm wide. 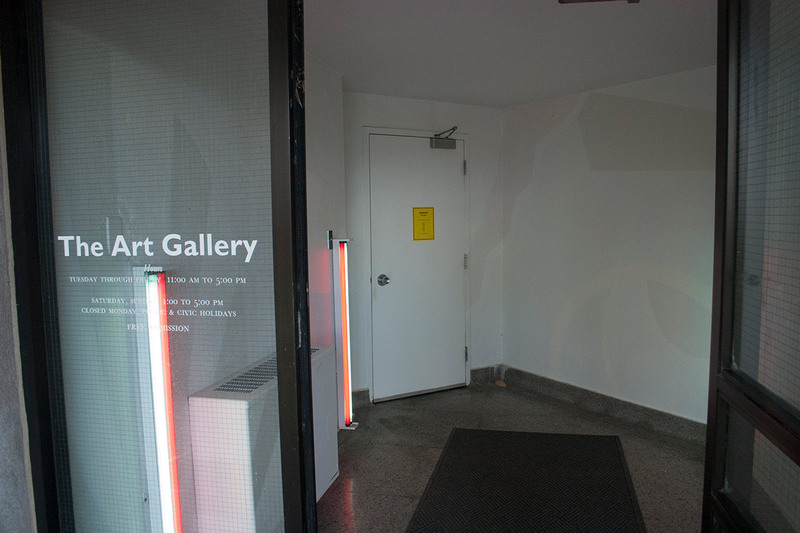 Once inside, the Gallery’s main entrance is located to the right and straight ahead. 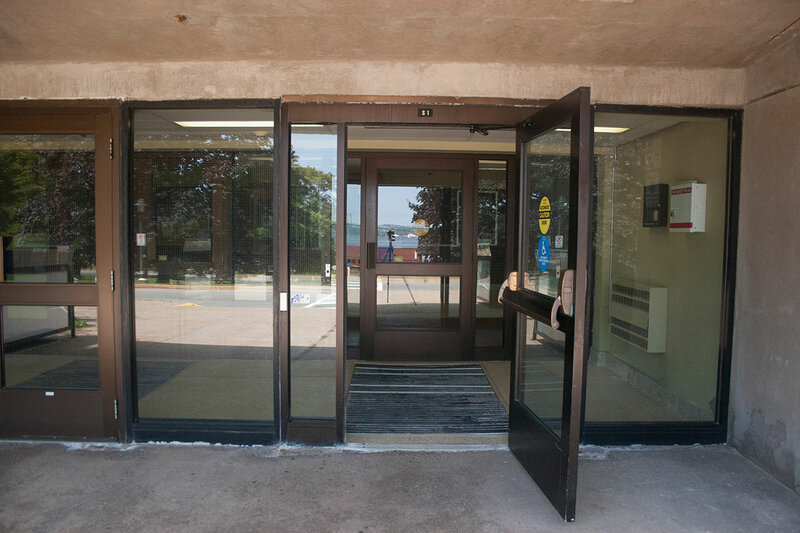 The door at this entrance is automated for accessible entry and is 90 cm wide (see image 4 below). 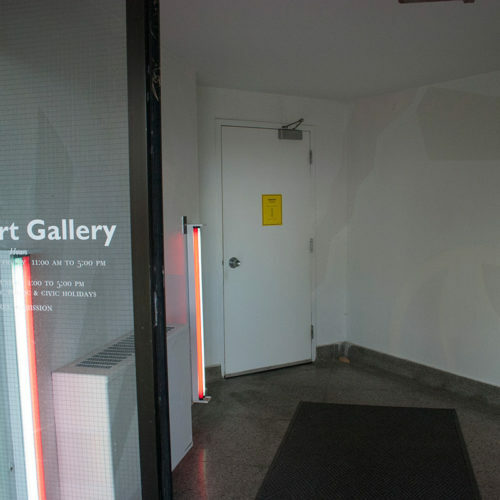 Once inside, the Gallery’s main entrance is located to the right and straight ahead. 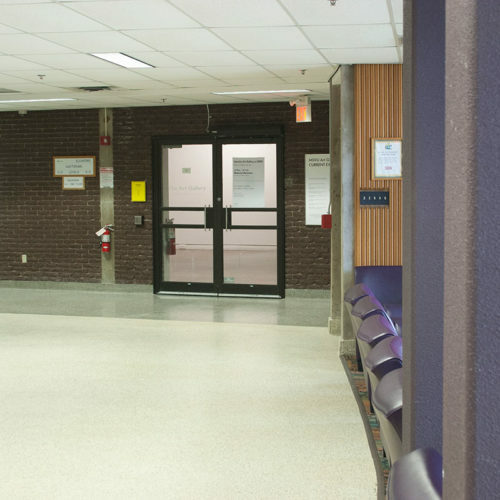 The door at this entrance is automated for accessible entry and is 90 cm wide. 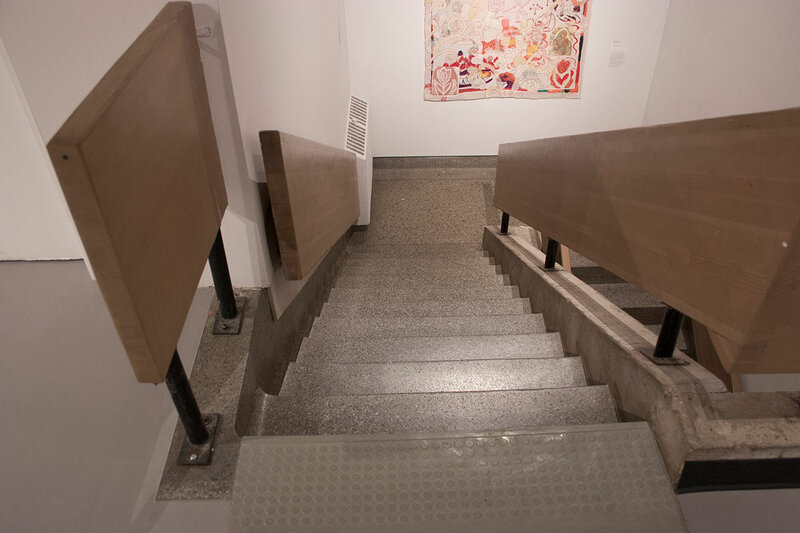 The mezzanine level of the Gallery can be accessed via a staircase (with 20 steps and a landing half way) inside the gallery. 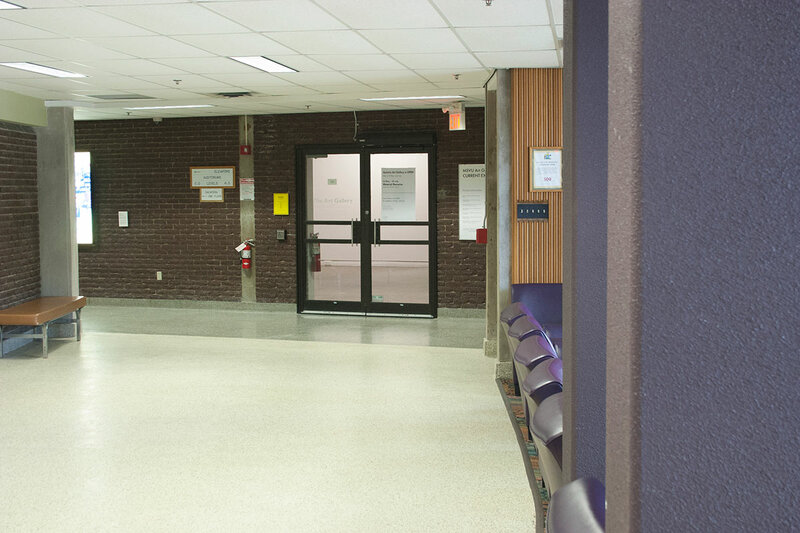 A nearby elevator can take visitors to the second floor. 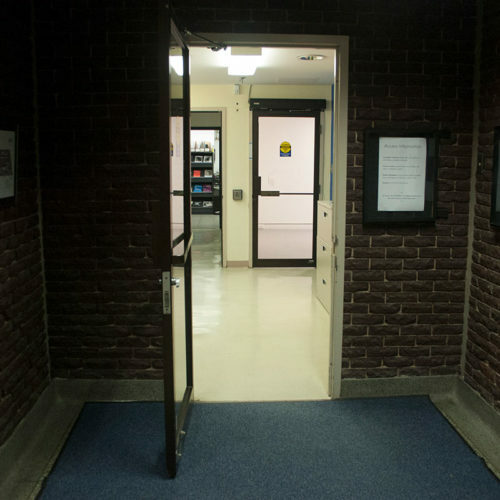 The elevator on the ground floor is in the hallway adjacent to the main entrance to the Gallery. 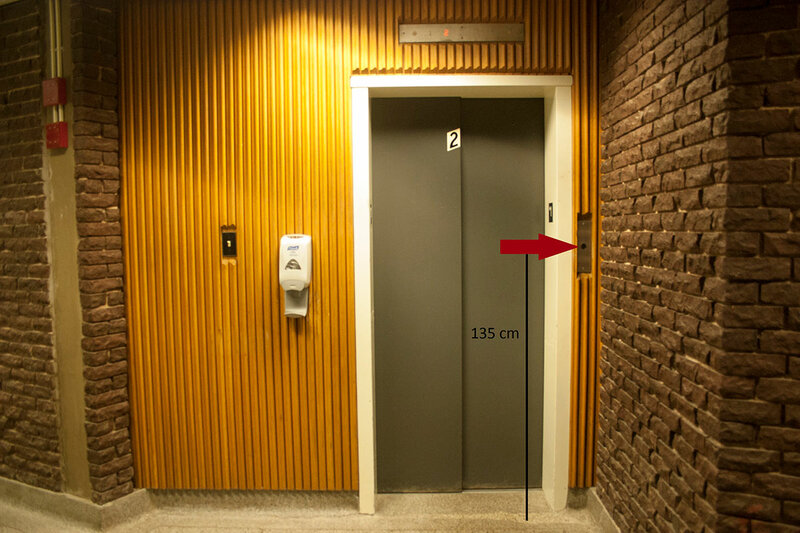 The elevator doors are 90 cm wide. 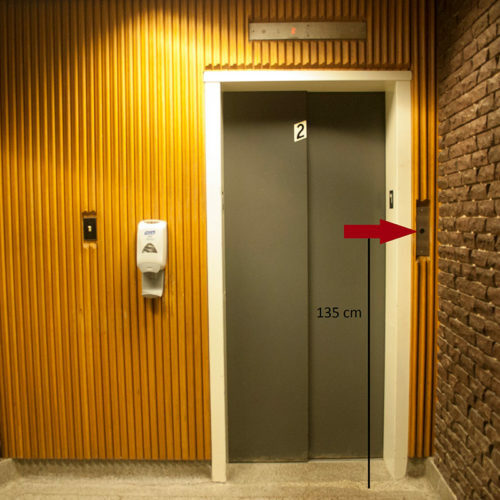 Elevator buttons are a minimum of 135 cm above the floor and may be difficult to reach for some people or certain kinds of wheelchairs – Gallery Attendants can assist with elevators. Take the elevator to the second floor. 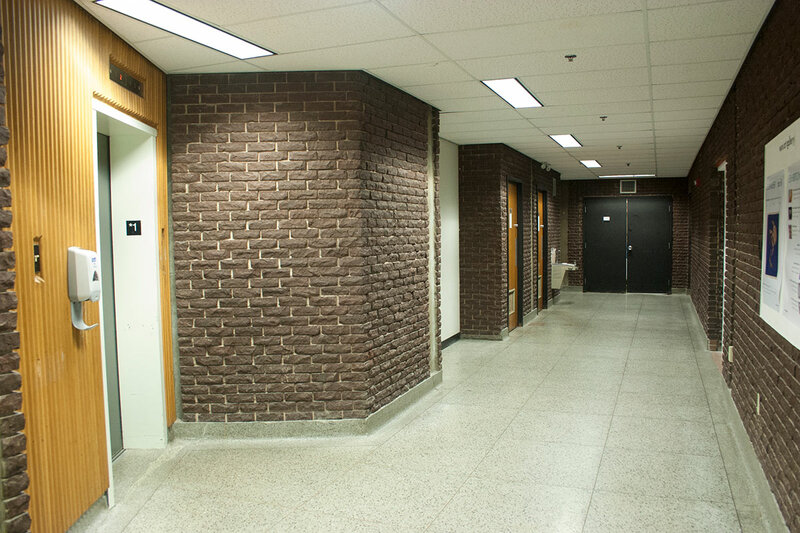 Once on the second floor, the Gallery’s entrance will be directly to the left of the elevator door. 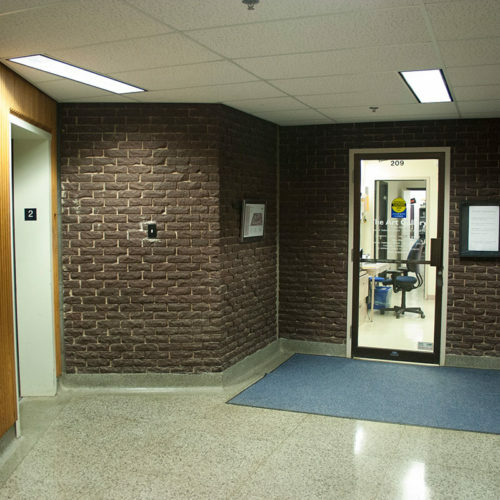 This entrance is automated via a button. This door is 85 cm wide. 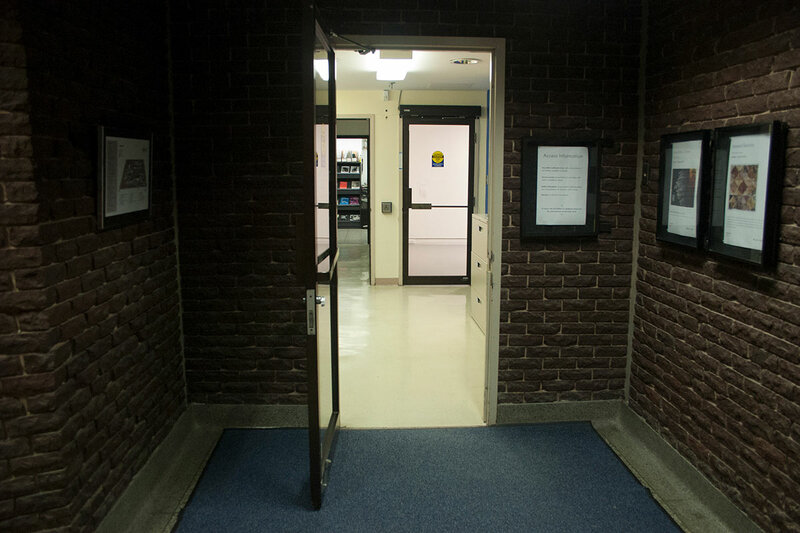 This entrance takes you through a small office area with a minimum clearance of 100 cm to another door to access the gallery. This second door is also automated and is 85 cm wide. 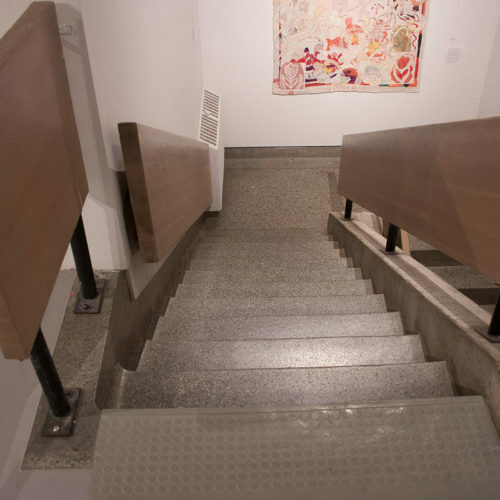 You will now be on the mezzanine level of the gallery. 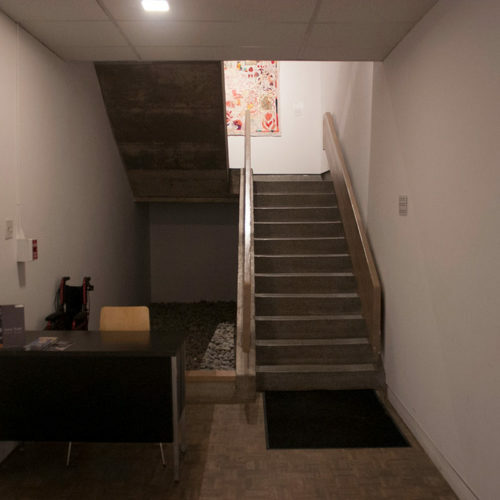 This entrance takes you through a small office area with a min clearance of 100cm to second automated 85 cm wide door to access the mezzanine gallery. 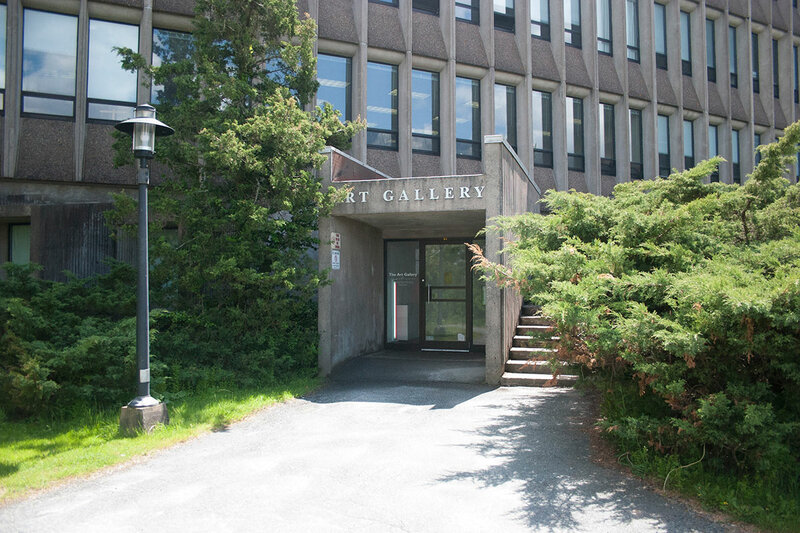 The gallery can also be entered via a side entrance on the outside of the Seton Academic Centre building. 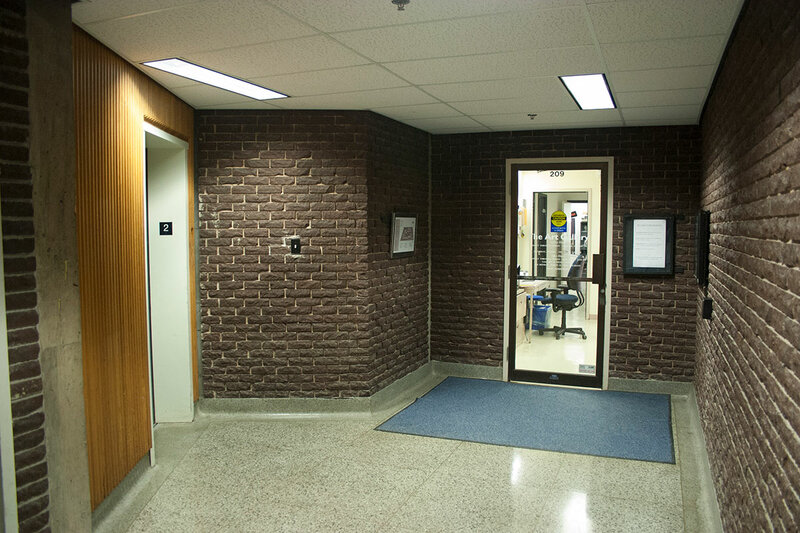 This entrance is not visible from the street but can be reached from a parking lot on far side of the building. 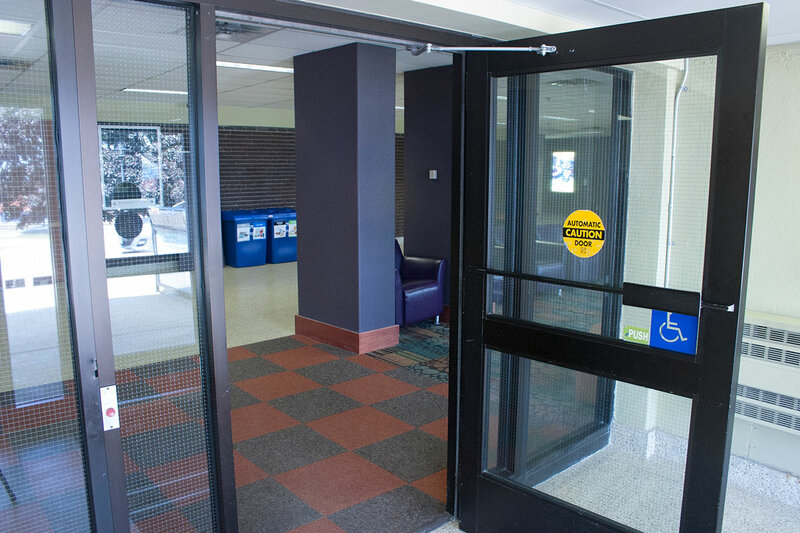 This entrance is not barrier-free. 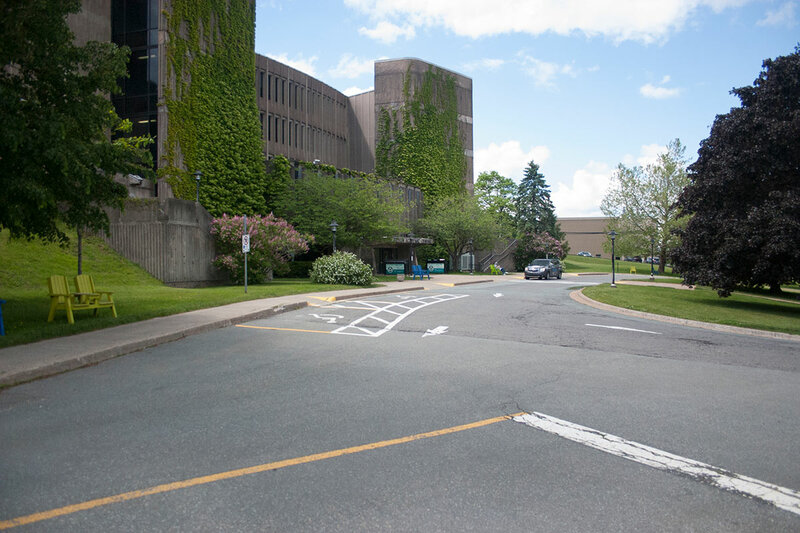 The parking lot can be accessed by turning right at the main driveway entrance to campus and following the road a short distance. The parking lot is then located on the left. This parking lot does not have accessible parking spaces. The parking lot has a path to the Gallery. 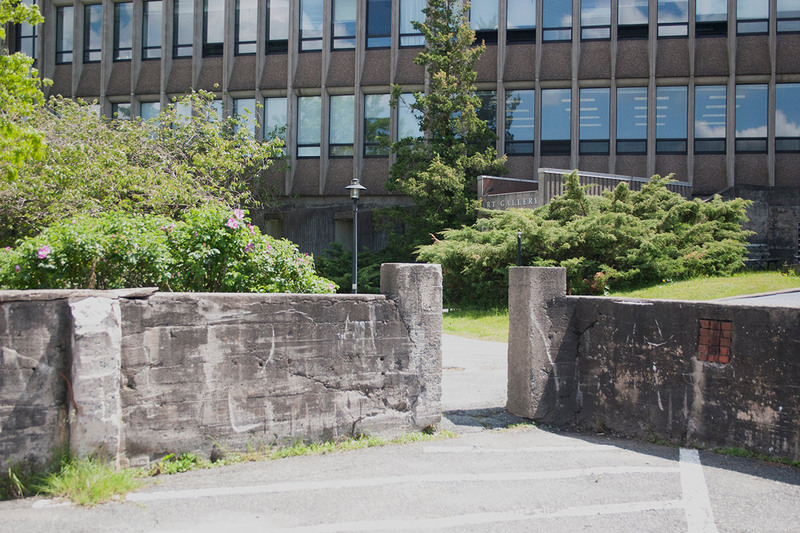 The entrance to the path from the parking lot has uneven ground and is flanked by concrete walls. The opening in the wall to access the path is narrow 90 cm wide and the threshold is uneven. 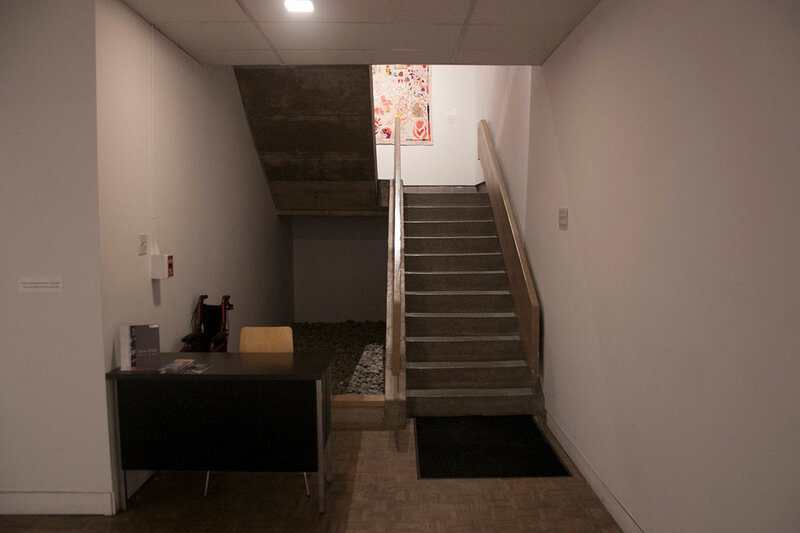 This entrance includes two doors leading to the mezzanine level on the second floor of the gallery. The first glass door measures 85 cm wide and is quite heavy. The second, a solid white door with a door knob, measures 85 cm wide. 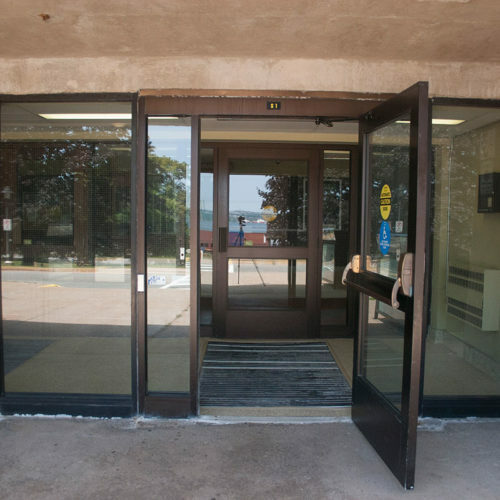 Neither of these doors are automated. 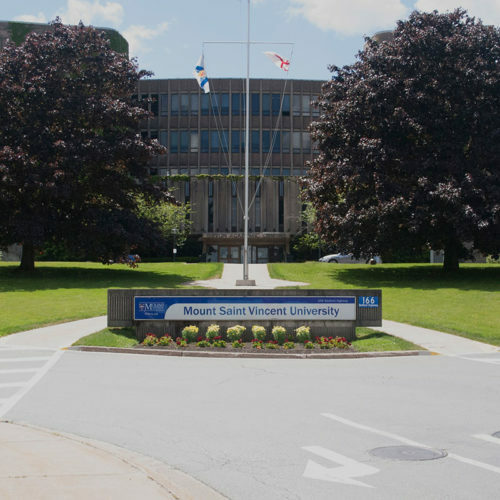 **Google Maps and MSVU Campus maps will often direct visitors to this entrance, however it is not accessible and is not recommended should you require a barrier-free route to the gallery.